For a long time we have been selling tropical hardwood decking with a heavy heart. While we would rather not do it, we know that up until now there has been no British grown alternative that matches these timbers for visual appeal, hardness and above all durability. Well now we have one – Brimstone Ash. This is a new product formed by super heating English ash to 210° degrees which stabilises the wood, makes it durable and turns it a beautiful dark chocolate brown. For more information see Brimstone overview page. 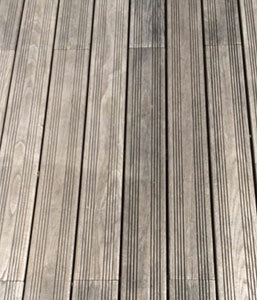 Thermally modified ash has been used for decking in the US for some time now and it is catching on fast across mainland Europe. Brimstone Ash is, however, the first commercially available thermally modified British ash product on the market. If you are considering using Ipe, Yellow Balau, Garapa of any of the other tropical hardwood decks then consider this first. You can get the same performance with the knowledge that you are supporting local woodlands and without any of the sustainability worries attached to tropical wood. Produced to comply with the harmonised standard for construction products regulation BSEN14915:2013. Appearance Consistent dark chocolate brown colouring with a clearly defined grain pattern. The colour is further enhanced by the application of a clear oil such as Osmo UV resistant oil. Weathering The modification process removes most natural extractives resulting in relatively consistent weathering largely free of staining. 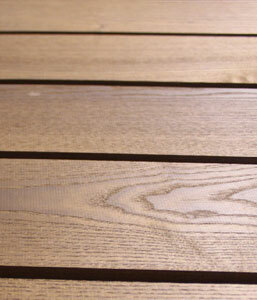 Weathering to a grey colour occurs more quickly than on non-modified timber. Some splitting may occur during dry periods. Insect attack Thermally modified wood is resistant to insect attack when used above ground contact. Resistance to fixing High. Modified wood is brittle and should be treated with care. Predrilling necessary. Strength Reduced due to modification process. Keep joists spacings to 300 – 400mm. When to fix Year round. Very stable in all conditions. Grading BS1186-3 1990 Class 1. EN942:2007. J20. CE grade A. Clean with a few small sound knots. Working properties Thermally modified woods are more brittle than untreated wood. Care should be taken when cutting and nailing to prevent chipping and break out. Pre-drilling is advised. Test glues before large-scale use. Water based glues do not work well. PU glues have tested well. Otherwise treat as a normal hardwood. Extractives The modification process involves no chemicals and any natural chemicals in the wood are removed during the process. Thermally modified wood can be treated as inert. *Brimstone products will be tested in 2017 to establish accurate data for durability, stability and strength. For now we base our information on European and American testing of similar products.